My name is Yakup Çetinkaya, and I’m a radio operator on the Greenpeace ship, Esperanza. I was recently on board the Esperanza during two non-violent direct actions in support of the Indonesian rainforest campaign on palm oil. It was inspiring to bear witness to Greenpeace activists standing up to dirty palm oil, by braving everything from being held in detention, to freezing temperatures and rough seas. Indonesian forests are home to orangutans, which in local language means “person of the forest”, and thousands of other species too. Sadly, the forests are being destroyed to produce palm oil. When companies destroy these forests they sometimes use fire, and from the fire comes carbon dioxide emissions. So, this isn’t just an issue for orangutans, it’s an issue for humans health too. The fires not only create a thick smoke that local people end up breathing, but also contribute to climate change. Despite promising to source their palm oil in a legal, ethical and sustainable way years ago, Wilmar, the biggest and dirtiest palm oil trader on the planet, has not delivered on that promise. So we, on the Greenpeace ship Esperanza, followed a tanker called “Stolt Tenacity” that was transporting Wilmar’s palm oil from Indonesia to Europe. 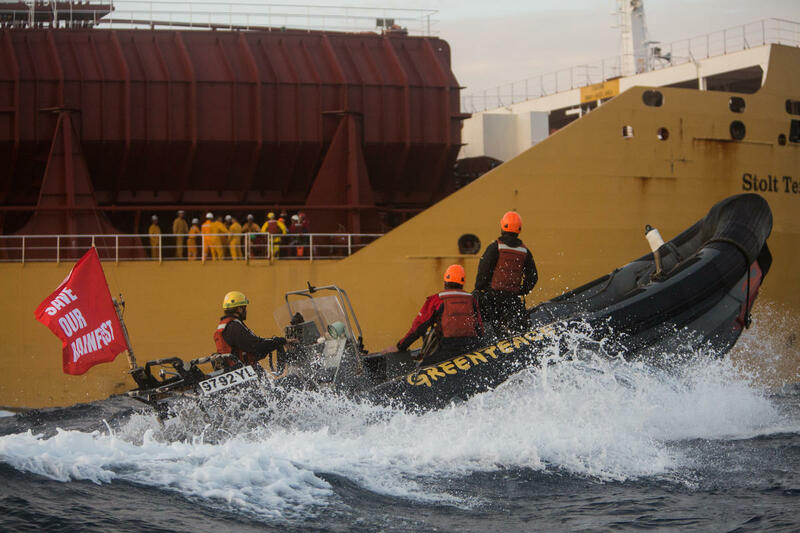 Six Greenpeace activists, from Indonesia, Germany, the UK, France, Canada and the US, boarded the tanker to peacefully protest against rainforest destruction in Indonesia. They were detained by the crew in one of the cargo ship’s cabins and were released only after 33 hours, when the captain of the tanker turned back to the Mediterranean to offload the activists at the Spanish port of Algeciras. We picked up the released activists in Lisbon, and kept following the tanker. Then, on November 24, we woke up way earlier than usual. It was a foggy and cold night, and we were close to Rotterdam, the busiest port of Europe. 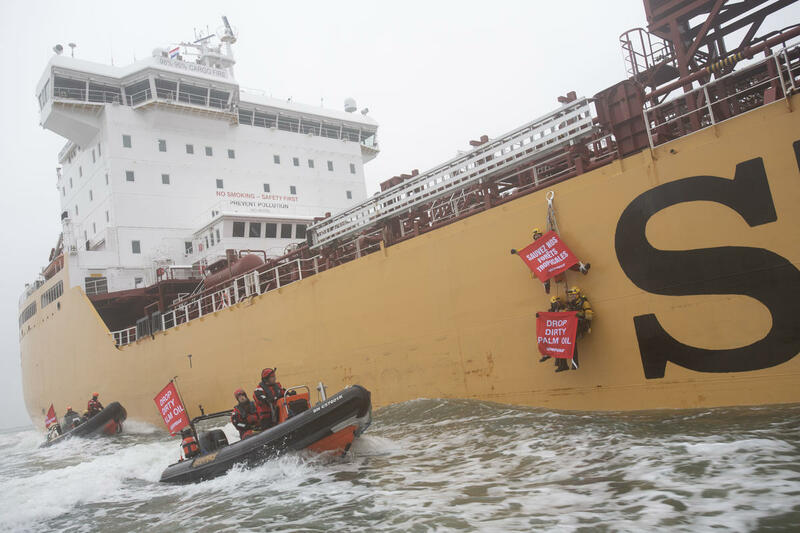 We had now been following the Stolt Tenacity for ten days, and the next non-violent direct action was underway, with Greenpeace Netherlands activists hanging on the side. The crew from the tanker tried to stop the activists from boarding the ship. But one of the activists managed to attach the rope on to the edge of a hook and open a hand banner saying “Stop dirty palm oil”. Soon after, two more activists were on the ropes and managed to open their banners too. Afterward, police sent the Greenpeace Netherlands boats away, signaling the end of the action. They’d been out on the boats in the freezing cold for over eight hours. The risks were high but they didn’t want to give up. They were bravely standing by their demand that Wilmar, and the brands it supplies like Oreo, drop dirty palm oil and protect the forests of Indonesia. It was amazing to see, so please stand with them by sending your own message to the maker of Oreo, Mondelez.